If you follow along with the tutorial, you should end up with the following live demonstration. 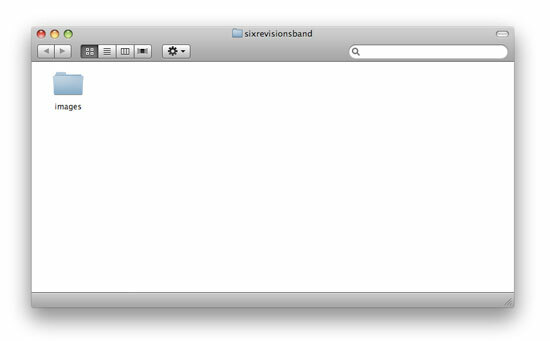 1 Start out by creating a new folder on your computer to put all of the site files in; I titled my folder sixrevisionsband. Create another folder in your working folder you just created and call it images; it will contain all the images, including CSS background images, for the site. 2 Now open up your favorite code editor (I use Coda.) Create a new HTML file titled index.html in the root of the folder -this will be our main page template. I like to keep all of my stylesheets in one folder in case I need to add a few different stylesheets. That way they are all kept together neatly. So we’ll add a folder titled css, and a CSS file inside it titled screen.css. 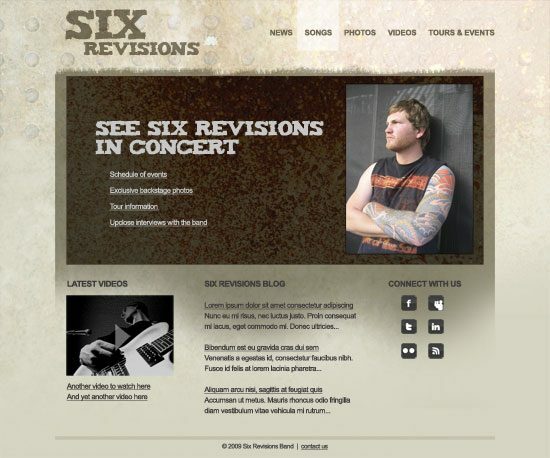 screen.css will be the main stylesheet for our template. 3 I like to start out from the back and work my way forward (towards the screen). If you downloaded the PSD file from Part 1, you’ll notice the layers are organized into folders: header, home, footer, and back. This helps for the coding process. 4 You’ll need to change the canvas size (Image > Canvas Size) to 1600px wide so the background will be wide enough to save as a full-width background. 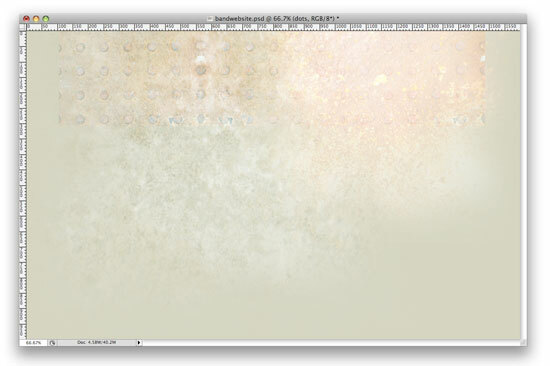 Once we do that, we see that the grid texture has harsh lines that we’ll need to get rid of. 5 We’ll create a mask like we did in Part 1. 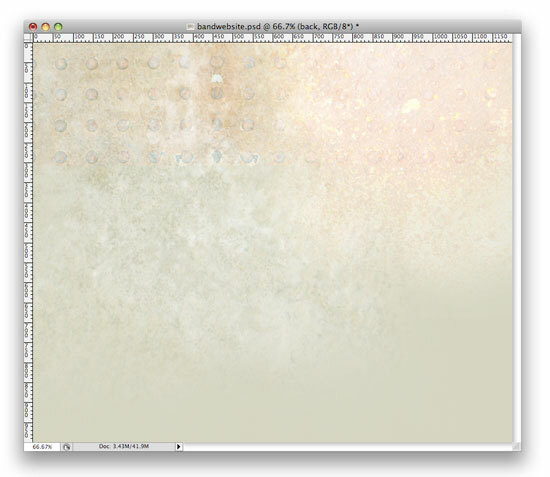 Select the layer with the grid texture by holding down the Cmd/Ctrl key and clicking on the layer thumbnail in the Layer Panel. 6 Then create the layer mask by clicking on the Add Layer Mask button at the bottom of the Layer Panel. 5 Our background is ready to save. Choose File > Save for Web & Devices. I like to experiment in here and find the best settings for the image, while trying to keep the file size as low as possible. With this image, I found that a JPG at 40% keeps the file size fairly low but the quality good enough so that it’s not pixilated. Save this to the images folder as background.jpg. 6 To add the background to your design, use the body element’s CSS background attribute. The style declaration below tells the background not to repeat, to be at the top and in the center at all times, and when the picture runs out, use the tan color #d5d4c2. 7 Turn all layer folders back on to see what’s next. I like to code in the order the items will be in the HTML, so the logo is next. I add some guides around the logo to make everything precise and then I crop the logo to the guidelines. I save this out as a JPG at 40% as well. 8 Now we’ll add the logo in with an h1 tag, which tells search engines that this an important element on our page. Then we’ll add an a tag inside of it that will link back to the homepage. I like to use a negative text-indent which will hide the text from sighted viewers, but will still be visible to search engines and screen-reading technologies. 9 Moving on to the navigation. 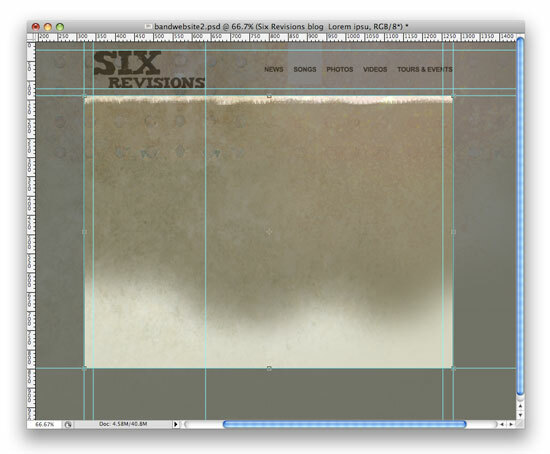 First we’ll go in and crop out the hover background, cropping it at 1px wide by 110px tall. We can save it out as a PNG-24. The transparency will work everywhere except in Internet Explorer 6 and below, but it’ll appear as a light grey background there, which I’m fine with. As a quick note, I do test and make sure my sites are functioning in Internet Explorer, but as you may know, IE6 has several issues, like not supporting certain image types (like PNG-24s) and misinterpreting certain CSS specs. So I find ways to make it work but according to browsers stats by w3 schools in October 2009, only 10.6% of internet users are still using IE6 and it appears to be dropping quickly. So, although the light grey hover background isn’t as classy as the transparent PNG-24, it gets the job done, which is my method for taking care of IE6. Period. Ok let’s move on. First, I floated the navigation to the right to get it into place. Then I added some styles to get the look of the text to be uppercase and bold with a 1.1em font size. Also, I changed the link color to #706752 and told it not to have any underline. Now onto our unordered list. First, I took away any list-style and zeroed out the padding and margins, and then added another float right to get it placed correctly. Next, I floated the li to the left to get each link to sit next to each other, because the default is to line up vertically. If you float the li right, then your links will be listed backwards. Then, I added padding to the top and bottom of the li with #navigation li to get the links in the right place. This padding spaces the li‘s out from side to side and also tells the hover action the height. And finally we add in our hover background, which will repeat horizontally. 10 Moving on to the content area. Back in Photoshop, we’ll turn off these groups: home and footer, leaving back and header group on. We’ll add guides to the top and the bottom of the content area to decide where we’d like to crop it. I find that 960 pixels wide by 710 pixels tall will be a good size and plenty tall enough. Crop it and save it for the web. And again, a JPG at 40% will do the trick. Then we’ll add a div called #contentarea for the content area and then style it. A simple hack was added here, as IE6 doesn’t recognize min-height. The two lines beneath min-height (height and _height) allow IE6 to recognize the fact that we’d like the #contentarea div to be at least 830px tall. I also added in padding to push all the content inside in the right place easily. 11 Next, inside the content area is the feature. You can place a slider here using this tutorial called Create a Slick and Accessible Slideshow Using jQuery or use a flash component. To keep things simple for the code and for the purposes of this tutorial, we’ll just simulate the look of the an animated feature with a simple image for now. The margin on bottom accounts for the space between the #flash div and the 3 columns that will be below. 12 Now we’ll crop out the next couple photos to get everything ready for the 3 columns of content below the flash. We’ll need to crop the video (which we’ll simulate with an image for this tutorial, just like we did with the #flash image), and the 6 social media icons. 13 Next we’ll set up the HTML for the columns. The br tag clears the float for the footer that will be below these columns. And the CSS is pretty simple as well. The line was added with a 6px border at the top and I needed some space above the line (which I created with margins) and some space below the line and above the text (which I created with padding). I also wanted some space below the text and before the edge of the browser window, which I created with padding as well. And the font size needed to be slightly smaller than the other body copy, so I made it .9em. Thanks for following along through the full tutorial. I hope you learned some coding techniques and PSD to XHTML/CSS tricks. Feel free to ask any questions and definitely let me know what you think in the comments area.